It might seem obvious to write about Romania’s Palace of the Parliament after a trip to Bucharest but it’s hard to leave without acknowledging that this is one of the most significant things I saw: it’s the second largest administrative building in the world, only top trumped by The Pentagon in the United States. It has 1,100 rooms, and is 66,000 square metres in size. The sheer scale of this landmark is mind boggling and if, like us, you take a tour around it, you’ll only get to see around 5% of the lavish rooms in your hour or so in the palace. However, notwithstanding the grandeur and magnificence of the building, sitting at the end of a long, leafy boulevard lined with beautiful flowing fountains, it is the human side of the story that I found most fascinating and thought-provoking (and in some cases really quite tragic). It is these stories that really brought home to me the significance of the palace as we wandered through the rooms on show during the guided tour. 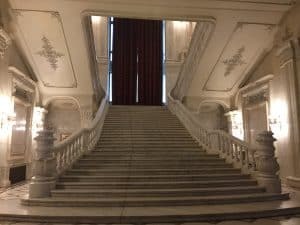 Our guide started with the history of the palace, it being originally the idea of the then President of Romania, Nicolae Ceausescu, in the late 1970s. Construction commenced in 1983 and was supposed to take only a few years (although it’s actually not complete even to this day). 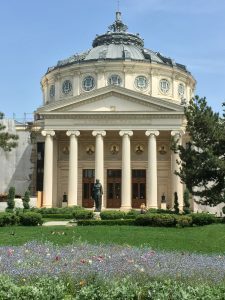 However, Ceausescu never lived in his dream home as he was executed on Christmas Day 1989, alongside his wife Elena, after a revolution (or a coup d’état depending on who you talk to) that removed him from power, another domino in the fall of Communism in Eastern Europe from the late 1980s onwards. 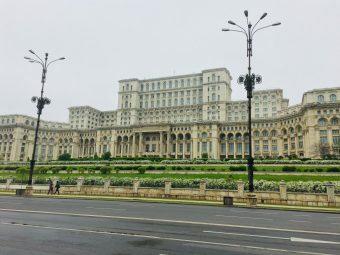 The stories our guide told us offered stark contrasts, a reminder of the difference between the world of the dictator Ceausescu and the people he ruled over. We were told, for example, that parts of the building were built and re-built and re-built again to meet the Ceausescus’ megalomaniacal desires, including the ornate and opulent marble staircases you see in the main hall (according to our guide the depth of the individual steps on the staircase were designed specifically to fit the length of Elena Ceausescu’s feet); by contrast, we were also told that thousands of workers (including political prisoners) laboured over the building of the palace and many died from the arduous work, and that approximately 7km of residential communities in the city’s Uranus area, including a number of local monasteries, were bulldozed to provide the land for the project. 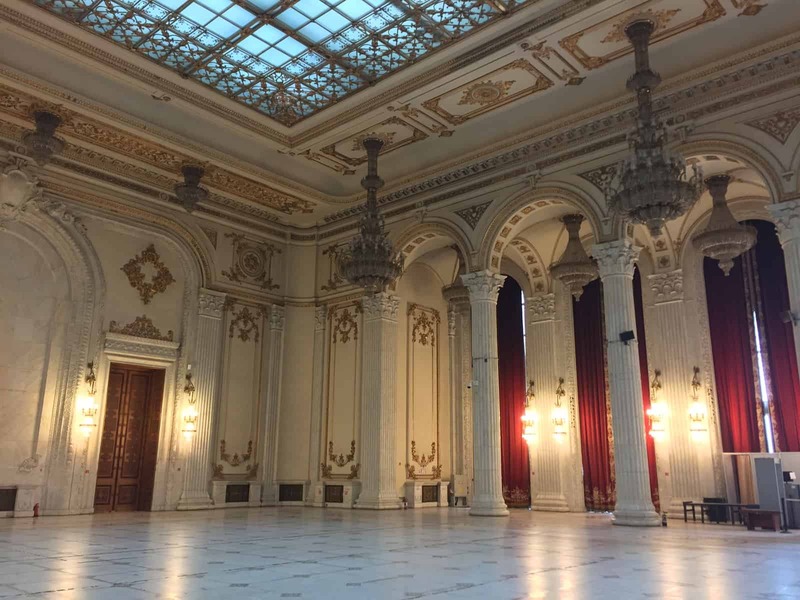 Likewise, although the project provided a fantastic opportunity for a young up-and-coming architect, Anca Petrescu, and many of the materials used were sourced from Romania’s interior, some parts of the palace could only be constructed with the aid of residents who were forced to do the work, including nuns who were made to painstakingly weave the heavy curtains that hang from many of the windows. When we walked between the different rooms, we saw the decadence at close quarters and it wasn’t hard to understand why the sheer intricacy of the designs meant it took so much time and so much labour to construct: the beautiful tiled and carpeted floors (running to 2,200 square metres), the marble pillars reaching up to ornate glass ceilings, the crystal chandeliers (there are 2,800 chandeliers in all here) and wood panelled walls. Some of these rooms are still in use, for example the Human Rights Hall. One room now hosts reward ceremonies and concerts. 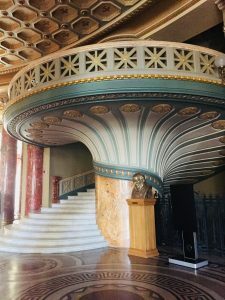 However, the original intention was to use it as a theatre but its shape meant that it was not possible to put in theatre curtains or build a useable backstage. 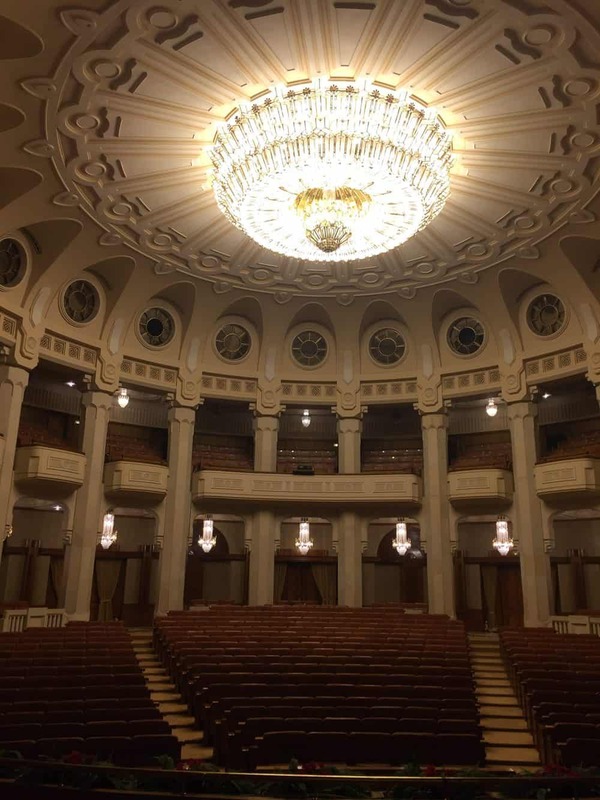 Look up and you can see round glass windows around the theatre, many of which have one part which is open and not covered with glass – according to our guide these open apertures are for ventilation: Ceausescu did not want air conditioning installed for fear that this could be used to poison him. Even today the contrasts still exist: this gargantuan and self-indulgent construction overlooks central Bucharest where only a stone’s throw away there are densely inhabited and high rise communist style blocks of flats and many of the buildings are crumbing and exhibit a faded glory. And I found it hard not to wonder how much money it takes to maintain this iconic building in light of the fact that this is one of the poorest countries in Europe. This said, there are signs of regeneration in the city (presumably assisted by funding since joining the EU in 2007) and lots of beautiful areas to visit and things to see – the lovely old town, a scattering of leafy city parks, gorgeous pre-World War 2 buildings, such as the Atheneum concert hall, not to mention the vast array of bars and restaurants to choose from which are lively, fun and incredible value for money (see below for more details). 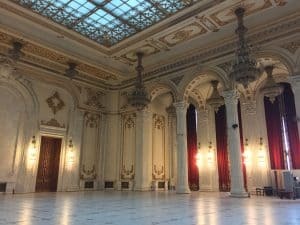 So whilst the People’s Palace might be hard to forget (and not always for the right reasons), it’s certainly a thought provoking place to visit, and there are plenty of other memorable things look back on in a short trip to Bucharest. If you want to visit the Palace of the Parliament it is best to book in advance. We didn’t, but were lucky and managed to get the last couple of weekend tickets; those behind us were disappointed. Don’t forget to take your passport which you have to hand in for the duration of your visit. 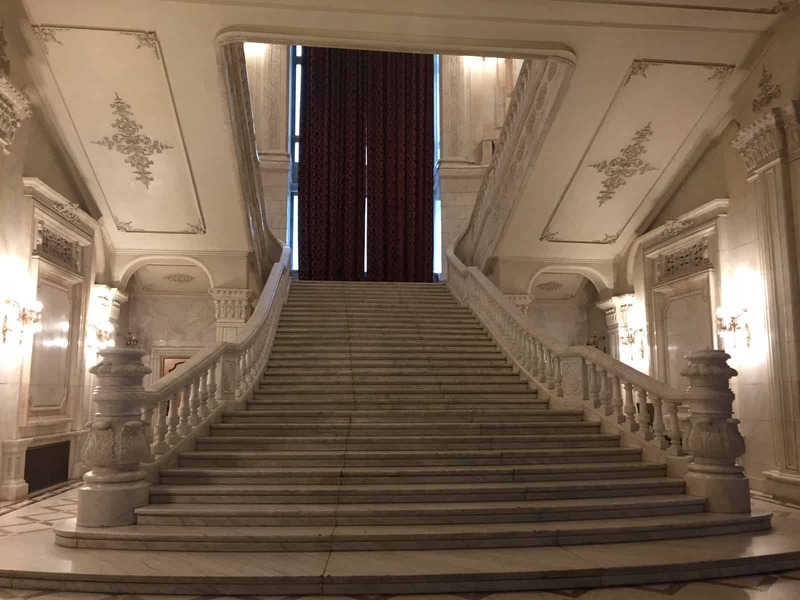 Other than a visit to the Palace of the Parliament, there are plenty of other things to do on a short visit to Bucharest. The Old Town of Lipscari is gorgeous, with its cobbled streets lined with many bars and restaurants and interspersed with Romanian Orthodox churches and monasteries. Eating out here is incredibly good value for money which makes for a reasonably priced break. 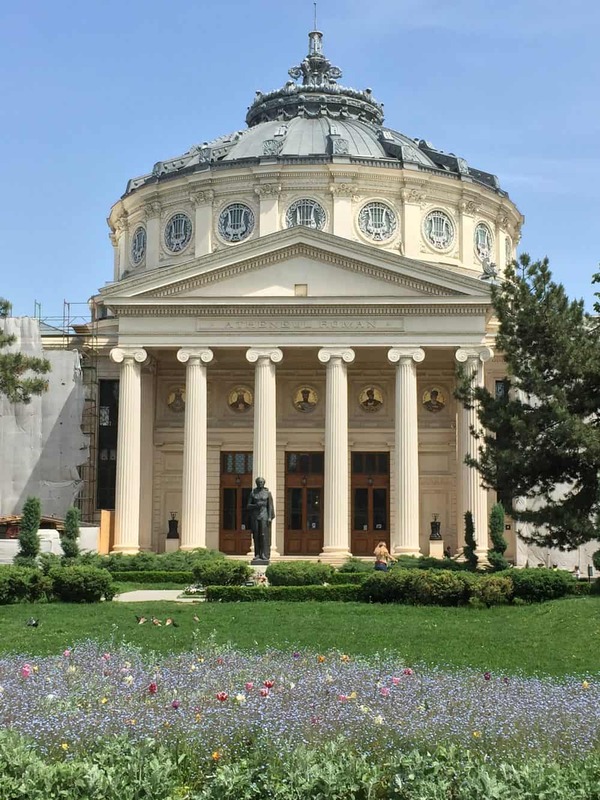 Nearby is the Cismigiu public gardens, which is a quiet and tranquil park with plenty of shaded places to escape the heat in summer and a small lake to stroll around. There is a great covered bar here next to the lake which is ideal for a quick pit stop. A little further out from the old town is Herastreu Park. This is a larger, more open park, with lots of trees, flowers, and sculptures that lead down to a large lake. It also has a traditional Romanian open air museum – The Village Museum (Muzeul Naţional al Satului Dimitrie Gusti) which has a collection of buildings and artefacts from across the different regions of the country. We didn’t have a chance to visit it, but heard that it comes highly recommended. This is near the grand Triumphal Arch (blink and you could think you were in Paris and looking at the Arc de Triomphe). 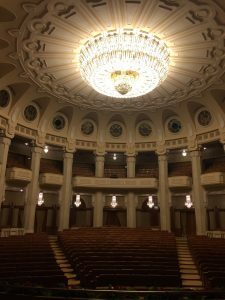 The Atheneum concert hall, just a short walk from the old town, is worth a quick visit. For a small fee, you can go inside and look around. When we visited, around lunchtime, we were lucky enough to have the whole place to ourselves. 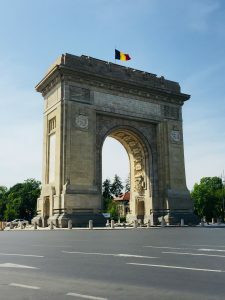 If you have the time, there are an array of trips using Bucharest as a base, which could be considered: for example, towards Transylvania and the Carpathian Mountains and the pretty towns of Brasov and Bran (Bran Castle, otherwise known as Dracula’s Castle is a particular draw); you can reach these in around 2.5 to 3.5 hours. We unfortunately didn’t have the time for this, but they’re on the list for next time! Getting there: There are a lot of carriers that fly direct from London to Bucharest – Wizz Air flies from Gatwick, Tarom and British Airways from Heathrow, Ryanair from Stansted and Blue Air from Luton. Depending on dates, it’s also possible to fly direct from Birmingham Airport. There are also flights to the city from across Europe (e.g. Italy, Germany, Norway, Greece, Turkey, Belgium and The Netherlands), and internally within Romania. There is a bus from the airport to the city centre, but we took a taxi – rates are so reasonable that it’s worth it for the time you save, especially if your time is short.